College was a simple time, sorta. Classes , job, social life, staying up all night on the internet or in front of a video game, and somehow living with just a few hours sleep here and there. It was basically childhood version 2.0 where I got to call my own shots. 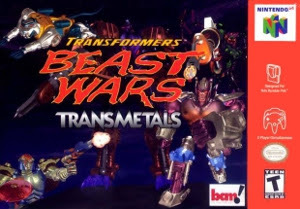 When the Beast Wars Transmetals game was first released as a Blockbuster Video rental exclusive here in the states, it's no surprise how that went. I'd regularly swing by the video store, rent the game, then a quick run through the nearby Taco Bell drive through before getting home. Several all nighters were spent with Cheetor walking in circles around opponents (it was a fighting game, a very basic fighting game meant for small children) and doing that weird kickball attack. Before long, I found a used copy of the game for sale. It was around the time I learned that there was a secret character named Megatron X (a variation of Megatron with dragon wings) and if I beat him the right way, he'd become a playable character. That's when the madness began. Each free night, I'd stock up on Taco Bell and Mtn Dew, then go all night. I was destined to unlock Megatron X, countless hours resulting in countless battles with him and heartburn. Frustration took hold and so did obsession. I was going to do this, I was going to win. My roommate and neighbors were going to kill me for the random screaming fits at 4am. That and the after effects of several hundred pounds of Taco Bell. I'm just as amazed as you that I'm still alive. In the end, I'd like to tell you I succeeded and unlocked Megatron X for play. Or is love to tell you I walked away from it out of better behavior. But eventually, I found a used copy of the PlayStation game that was tons better. But there was still tacos.